This past Saturday morning, we were frantically setting out all the pastries on display and getting ready to start service for our Pastry Pop Up event. We had just finished up unloading the truck that brought over the half dozen racks filled with bread and croissants minutes before and we were anxiously awaiting to see how the day would go. When the last of our team members were finished carrying in gallons of coffee and boxes of all the odds and ends we'd need for the day, they said to me..."Jojo, you really need to look outside." I knew we were cutting it super close so I wasn't able to take in the view in person but I saw from pictures and videos which friends later showed me that there was a crowd lined up around the block waiting for the pop up shop to open. I honestly wanted to cry when I saw this video (above) and wanted to share it with you.....if you click on the picture below, you can also see all the other photos from the event. Last week our entire team worked incredibly hard around the clock to make over a thousand pastries and a hundred loaves of bread for this one day...this was definitely the biggest bake we'd ever undertaken! True to our roots as an artisan bakery, we rolled out every single bread and croissant dough by hand. Every single pastry cream, jam, and filling was prepared from scratch with the best ingredients we could source because our priority was in providing the tastiest treats possible for you. Seeing you all come out to support us and our work meant the world....it made every moment of our time and effort more than worth it. Towards the end of the day, we did not have a single baked item left behind....all we had was endless gratitude. I want to sincerely thank every single person who came to this event and all our past Pop Ups as well! We love baking for you and we are so thankful to be a part of such a tremendous community. Over the last few years as we slowly grew our small business, it was important for me that we lead with our strengths and focus on what we do best - producing naturally leavened bread. I have spent many years trying to learn the craft of traditional bread baking, and I must say, the learning has yet to end. But I also knew that one day, we will need to expand our offerings and bring something absolutely delicious to the table. Viennoiserie has always been that something for me. Viennoiserie is the meeting point between pastry and bread. And so, it was a natural progression to make in my development as a baker. This category of goods requires knowledge of bread-making principles and also skills associated with pastry-making such as visual composition and beautiful presentation. If you've had the fortune of trying crisp croissants that shatter at the bite, delectable danishes, or a rich golden brioche...then you've had viennoiserie. The taste and flavor of these when freshly made from scratch is incomparable to anything. In order to perfect my technique in lamination required for viennoiserie products, I have been traveling whenever I had a pocket of free time to learn from those who are far better than me. The baking community is an exceptionally generous group of people and I've been very lucky to have had the opportunity to go up and down both coasts as well as within the heartland staging at incredible bakeries and attending workshops taught by some of the top bakers in the country. From the Pacific Northwest to California, from Rhode Island to North Carolina, and here from Madison to Chicago to Michigan....the few pictures below summarize what I've learned on my travels and what we will be making for you. We made all these croissants last week as part of recipe trials for our March fundraising event - the Pastry Pop Up! We have been anxious for you to try out our pastries ahead of the indoor market opening and so we are collaborating with our amazing friends at GEM (located in the former Nadi building at 406 E. State St.) to set up a bakery for a day in their beautiful downtown space next week on Saturday, March 30th from 9am to 2pm. From now until next Wednesday, we are offering a special pre-sale ticket for $10 that will turn into a $12 credit towards your purchase on the day of the event. You can get the tickets HERE. This Pop Up is a little different than our previous ones as it is set up in a traditional bake sale way rather than a sit-down meal event. We will have a large variety of sweet and savory pastries, coffee and other beverages, and, of course, bread available for purchase. I sincerely hope you will join us next weekend and also would greatly appreciate if you help us spread the word about this event to your friends and family! 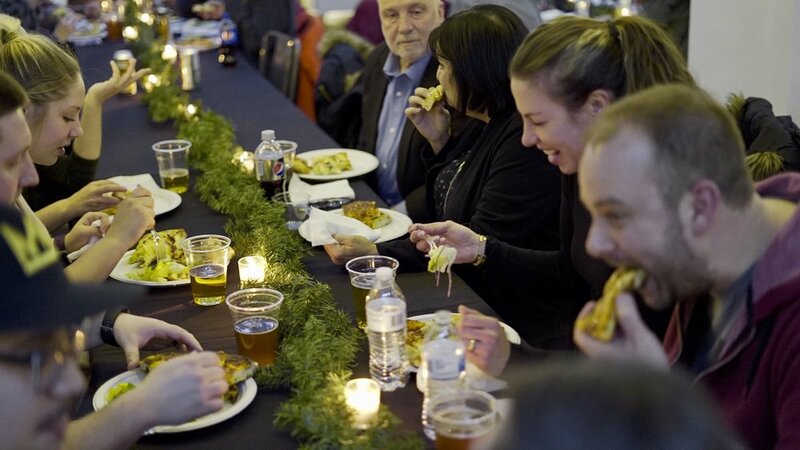 Our second pop-up event turned out just fantastic...we are still reeling from Friday night. 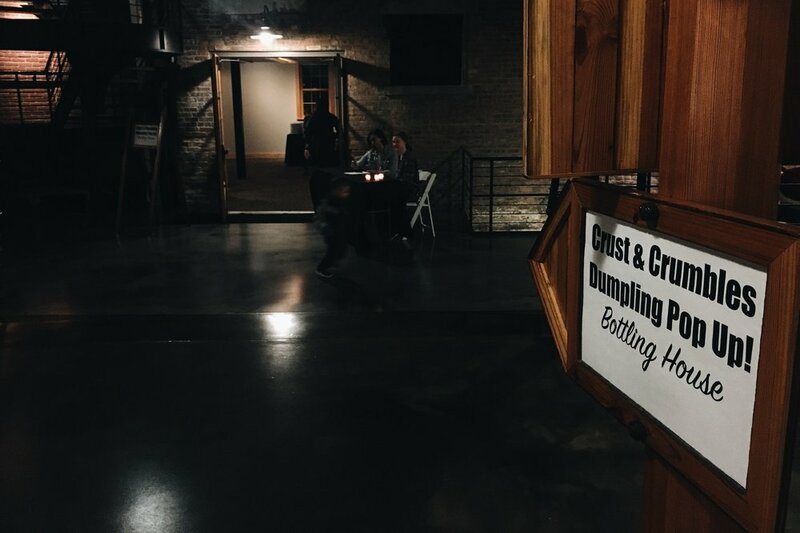 We sold out again and got to share our love for dumplings with over 120 people that came out from Rockford and all surrounding areas. We are incredibly lucky to have such solid support within our wonderful community and we know it! From the bottom of our hearts, thank you so much to each and every single person that came out to our Dumpling Pop Up fundraiser party as well as to those who generously sent in donations to our Brick & Mortar fund! I want to take a moment and also thank my family, my C&C crew, and our awesome friends at Prairie St. Brewing Co. who put in a lot of hard work last week to pull off another successful event. I didn't know it at the time but apparently we also got a nice shout out on the radio from the folks at 97ZOK. I thought was really cool... We also didn't get a chance to get many pictures at the event so if any of you want to share yours with us, feel free to send them along. I got a really sweet message today about a 6 year-old kid who has been dying to try dumplings ever since seeing Pixar's animated short film, Bao. I saw it recently with my daughter as well and it definitely made me tear up...I don't want to give it away if you haven't seen it yet but it's about a mother and her child. I didn't realize until I read more about the film that bao not only means "dumpling" in Chinese but that it can also translate to "treasure" or "something precious." It makes sense then that this story is about how precious our children are to us. It also didn't dawn on me till after this conversation that there wasn't another place in town for this family to take their kids to for bao style dumplings. And I just can't let this be. Long story short...now that we have more hosting space for our Dumpling Pop Up unlike last time, we would like to add a lower pricing option for children, ages 10 and under, so that you can feel free to bring your whole family to the event. After all, that's what Lunar New Year is all about - family. For those of you that haven't reserved yet, there are only TEN days left till the event. I really hope you can make it! You can purchase your tickets through our online shop. Earlier this week, my family and I were celebrating Lunar New Year and ushering in the Year of Boar around our house. The best part was definitely the fact that my mom is visiting right now from Mongolia and so we got to celebrate the occasion with much more tradition and custom than I normally would've if she wasn't here. It's such an important holiday for us back home and it's all centered around family, friends, and food. This is why I'm so excited to share with you all a part of my culture and invite you to our Dumpling Pop Up! 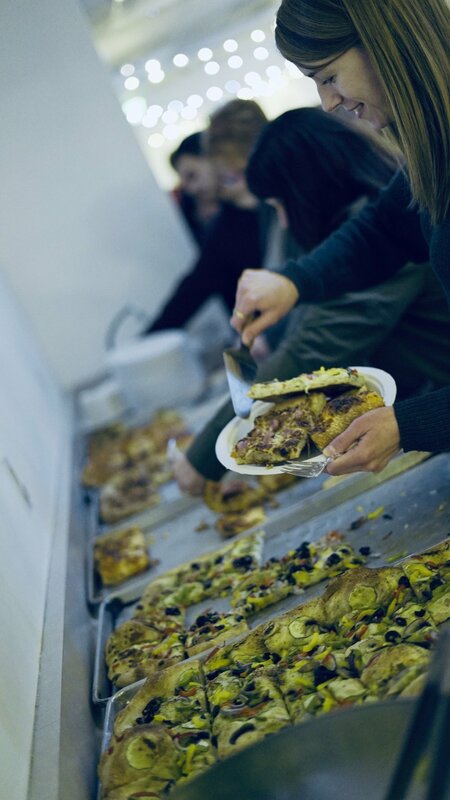 We had such a good time at our pizza party last month and I have no doubt that this month's pop up will be lots of fun as well. 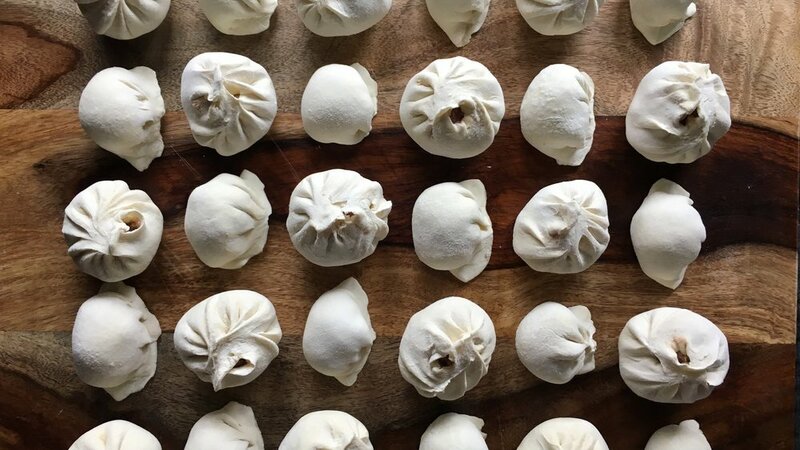 We're planning on making traditional Mongolian style steamed dumplings for everyone. It will be an all-you-can-eat set up again with some yummy salads on the side. 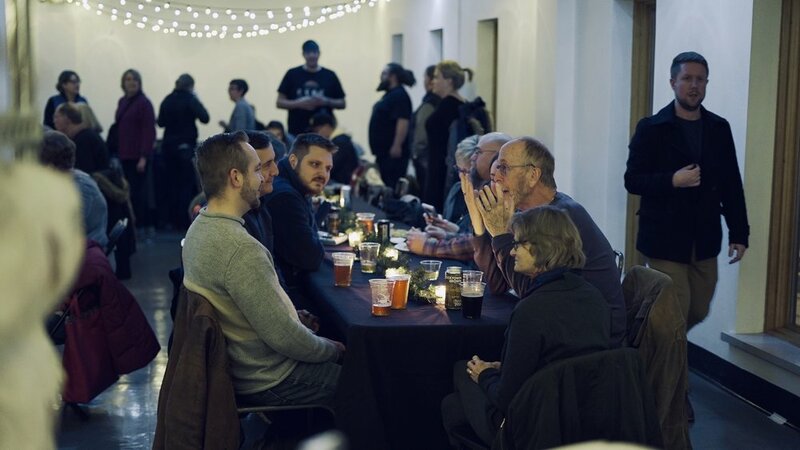 Our friends from Prairie St. Brewing Co. generously offered to host it at the brewery this time so that we could fit in more folks...our January pop-up sold out and we weren't able to accommodate all the people who still wanted to attend inside our space at C&C. The event will be held on Friday, February 22nd from 6 - 9pm. Like last time, it's by reservation only and you can purchase tickets below. 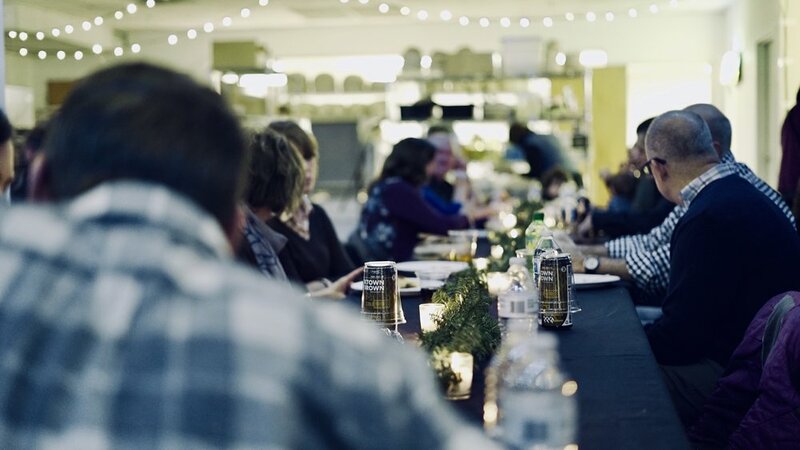 As I've mentioned before, our goal is to hold a few different special events leading up to the big move into our new bakery location at the Rockford City Indoor Market this April. The money we raise through these pop-ups/donations go towards our Brick & Mortar Fund and helps us pay for build-out construction costs as well as equipment purchases. Please help us spread the word by letting your family and friends know about the Dumpling Pop Up! You can forward them this post or send them a direct link to our website. We have also created a Facebook event if that will make it easier for you to share the information. Thank you so much in advance! Somewhere in between traveling out of town and defrosting my entire being from the polar vortex freeze, two weeks have gone by since our Pizza Pop Up...and I really would've liked to have shared this with you all much sooner! The event was just amazing...the whole C&C crew was at the top of their game; the food was delicious and plentiful; we sold out of seats and fed over a 100 people that night; our humble space was filled to the brim with family members, friends, and loyal customers; and our hearts were fuller still from witnessing all that love and support. I just want to say that we are SO grateful to all who came to the event, to all who helped us spread the word about it, and to all those who generously sent in donations even though you couldn't attend!!! Oh and we also got a nice shout out on the news from WREX who made a point to stop in that night. You can view the story HERE. A new month is upon us now and so is a new pop-up! We are getting our ducks in a row for it and will release more details in the next few days as soon as the event location is finalized and our website is ready to accept reservations. What is for certain now is that we will have it on the evening of Friday, February 22nd, so SAVE THE DATE! Our Pizza Pop Up fundraiser is coming up in just a few days and we have been anxiously getting ready for it...test baking a bunch of pizza, cleaning up, and decorating! We just want everyone to have a really good time and leave from here with a belly full of good food. Other than hosting monthly baking classes, our kitchen is not open to the public and this is the first time we will have this many people in our space. We are super excited!! I have been absolutely blown away by the response to our event since we announced it last week. We have had loads of people reserving seats, sending donations, sharing the event online, posting about it everywhere, and, not to mention, all our wonderful friends stepping up to offer extra help for the night of. I'm stunned to say that we are nearing full capacity for seating. If you want to join us this coming Friday night, please buy your tickets sooner than later so that you don't miss out! We have also had a number of generous people who have made donations to our Brick & Mortar fund. If you can't come to the Pizza Pop Up, I ask you to please consider making a donation in lieu of attendance. Every little bit helps towards our goal of building and opening Rockford's only artisan bread bakery! First of all, Happy New Year and hope your 2019 is starting off with a bang! From the moment we turned the calendar page over, we have hit the ground running towards our next big move. This will be the year we finally open our bakery cafe in downtown Rockford. The indoor market building on Madison St. has been under construction since the kickoff last spring and we are a few months away from taking over our spot in there. It's an enormous project and I take my hat off to all the people involved as they have been tirelessly working on restoring and beautifying the space for the community to enjoy. I have never done this before...as it turns out, opening a bakery shop is a mountain of work and sometimes it feels overwhelming. Our current space is not a retail store; it's more of a production kitchen and so this whole new thing has come with a steep learning curve for me. Thank goodness I am surrounded by exceptional and knowledgeable people who are helping me through this process. My focus is on creating an amazing experience: for those who are visiting the cafe, for those who are enjoying our products, and for those who are working there. In making all this happen, there are so many factors to consider and, honestly, quite a bit of cost to bear. For the last three years, we have met some amazing people through baking bread for all the farmer's markets, through our CSB program, and through our classes. All of you. We are hosting a Pizza Pop Up fundraiser on Friday, January 18th at our current kitchen space and you are all invited! All proceeds from the event will go to helping with build-out and construction of the bakery cafe. You have shown up for us wherever we were setting up, for whatever bread we had on hand, and however the weather turned out that day...and I really hope you will show up this time too because we can't do it without you. Please help us spread the word by letting your family and friends know about the Pizza Pop Up! You can forward them this email or send them a direct link to our website. We have also created a Facebook event if that will make it easier for you to share the information. Thank you so much in advance and we can’t wait to see you there! I want to thank you all so much for helping make this year as amazing as it was! This coming spring, we will be moving into our new location at the Rockford City Indoor Market on Madison St. We are going to be giving our all to this project in the next few months and we want you to be a part of it. In January and February, we are planning a couple of special pop-up events that we'll be sending out invitations for once all the details are hashed out...we hope you will come out and support us! The first one is January 18th, so SAVE THE DATE!!! I wish you all a safe, splendid New Year's Eve and a spectacular year ahead! Every year, during Thanksgiving and Christmas only, we make our miches available for purchase. These large traditional French style loaves are made with organic high extraction wheat flour as well as a touch of dark rye, span over a foot in diameter, and weigh in at about 1.6-1.8 kilograms. 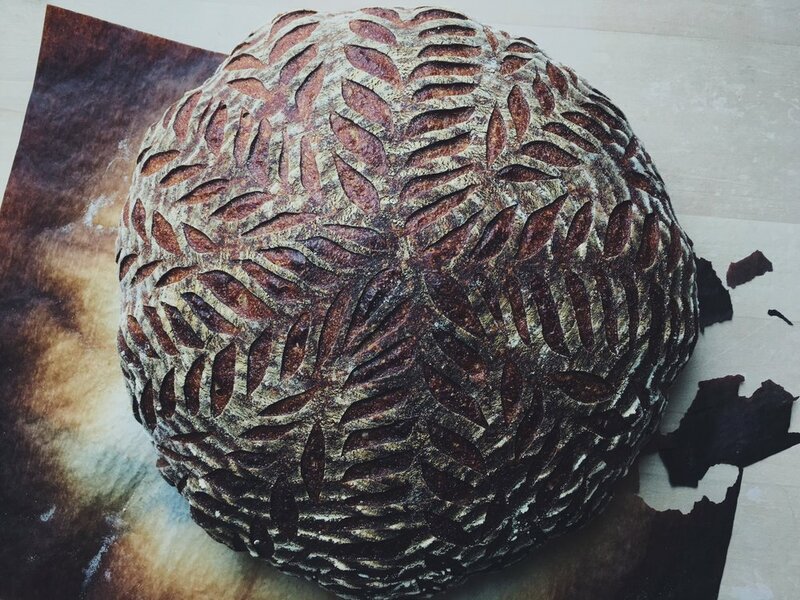 We naturally leaven them with our sourdough culture, slow ferment them for a couple of days, and hand score each bread to produce a beautiful design on the crust. You can pre-order these until next Thursday through our website for pick up on either 12/22nd or 12/23rd at Artale & Co.
During this past year, we've had the pleasure of welcoming folks from near and far into our kitchen to learn the art of bread baking. Our classes focus on the fundamentals of sourdough and on how to recreate the effects of a commercial oven in the home environment. We teach the process from beginning to end and provide a "bread baking essentials" starter kit for all the participants. Currently, we are offering one class in January and one in February of 2019. While this is isn't an actual blind date with one of us (sorry! ), it's our version of a Community Supported Bakery program. Our weekly bread shares feature baker's choice loaves and so members never know which type of bread they're going to get. Our CSB has pick up locations on both East and West sides of Rockford. If you have someone who loves good bread and might enjoy the surprise element, this is a good one for them! You'll find more details on how the CSB works at the link above.